A client recently called to ask whether they need to obtain a 'certified' copy of their deed. She had received a letter from National Deed Service stating she could should get a Certified copy of her deed, how important the document is, since it's evidence the property was transferred to her. All she has to do is send $59.50 to obtain this important document. RIPOFF! A private company is currently sending out letters nationwide offering to sell property owners certified copies of deeds. The letters refer to information found in FCIC’s “Managing Household Records” 2003 online consumer focus article. 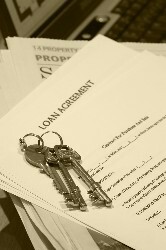 The company cites that article as a reason for purchasing a certified deed. Consumers should be aware that it is not necessary to use a private company to obtain a certified copy of the deed to your home. You can obtain one from your local Register of Deeds for free or at a low cost. If you live in Marion County you can get a certified Deed at the County Recorders Office for $5.00 if you search for it yourself. If they do the search, it's $5.00 additional. First, check the closing documents you received from the title company when you bought your home; chances are - you already have a certified copy. Great to know! New home buyers are often flooded with this type of scam and it's reassuring to know that we can save folks money when we inform them of these types of programs. Thanks for the post!